The two-in-one foldable manual treadmill and sit-up machine by Soozier with incline for walking or jogging, rather than running. And it allows you to do sit ups like on a sit up bench when you sit on the treadmill belt and put your feet underneath the foam rollers that you see in the photos. 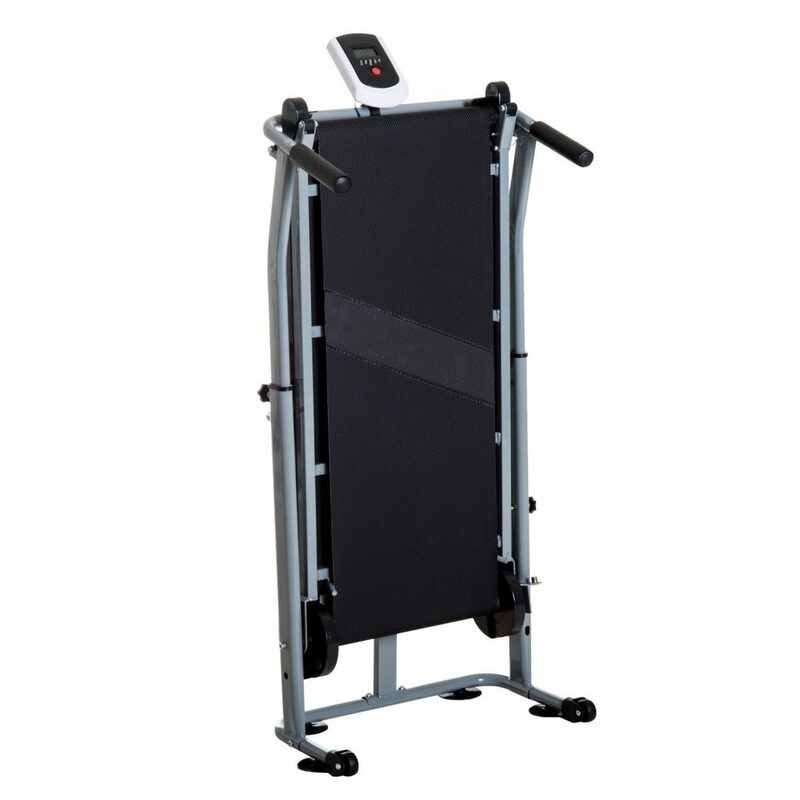 It is nice to have the manual walking treadmill and a sit-up bench for great abdominal workout in a single machine in a great convenient two-in-one design. You will work your leg muscles and your core section whenever you want in the comfort of your home. I personally prefer a manual treadmill to an electric motorized one as I feel more in control of what I do and I can do it all at my own pace without extra pressure. And on the manual treadmill at the gym there is no limit to the speed I can reach- I just feel that I am both more comfortable and experience more challenge during my sessions. It is nice to be able to set the pace, rather than an automatic motorized unit managed by a control panel with speed options. You will also be saving on your energy bills by using this manual treadmill and you shall not need to be near a power outlet. The LCD Display Panel is easy to read and operate and lets you keep track of your progress and shows the calories burnt, current speed, time exercised, and distance traveled. You also have the Scan function that shows each workout metric automatically, one by one without you pressing anything manually. You can choose from the 15 or 20 degree incline positions to adjust the intensity of your workout. You can also move the handles up and down to three different heights for you to hold them at a comfortable height. The manual treadmill has an upright foldable design and includes two transport wheels that let you move the unit easily and store it away when you’re not exercising. 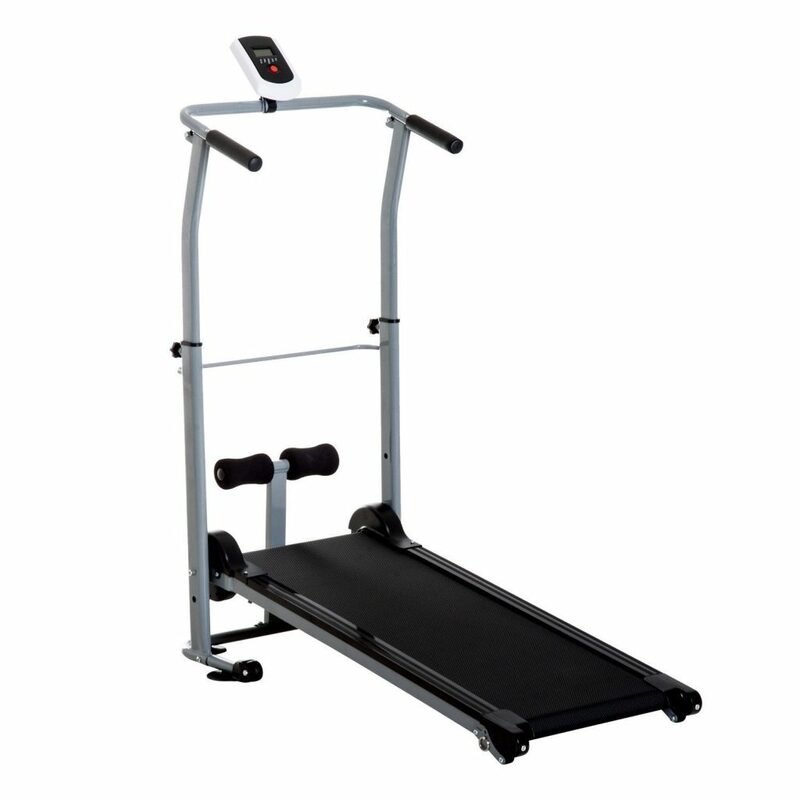 Soozier Manual Treadmill measures 20.50L x 15W x 42.25H inches as folded vertically. You can use it at home in your living room or home gym area or in the office and then fold it vertically and move it away when you’re done with your session. This great little manual treadmill is powered by your leg strides and you can get a great cardiovascular workout and stronger legs over time if you use it regularly. But it is important that you support your workout with a balanced and healthy diet on a daily basis. It runs quietly and you can just set it in front of your TV or computer screen, watch shows or other videos or listen to music to be able to work out much longer. You’ll basically be able to burn calories and fat off your whole body, not just your legs. The foam rollers on the sit-up section is nicely padded for your comfort so you can do many repetitions every day without any problems. The walking and jogging surface is textured and anti-slip and you can feel safe. You need AA batteries that are not included for the LCD display panel as the unit is not connected to a power outlet. MDF and EVA materials are used on the stainless steel frame. The Soozier Manual Treadmill weighs 33 pounds with a 240 lb. user weight capacity and measures (42.25- 49.25)H x 41.75D x 20.5L inches. The runway or the running belt is 36.25 x 13.50 inches, which is fine for walking or jogging but not a lot for very large size people. Overall it offers pretty good value for the dollar as it costs much less than a regular electric motorized treadmill, yet works equally well for burning calories and fat.